This entry was posted in General, Groups, News, Planning, Weeds and tagged For environmental work, Rates on 6 May, 2016 by Bushcare Office. Great things are happening for the environment in the Blue Mountains. Three catchment working groups currently exist and I have just seen a very inspiring presentation on the work in Popes Glen in Blackheath. The latest excitement is the creation of the Jamison Creek Catchment Working Group. This unique catchment, unique because it exists on both sides of the Highway, is very important, but like most catchments, is under stress. Weeds, pollution, sedimentation and high water flow issues abound. However, by utilising procedures, knowledge and actions created by other working groups, Jamison Creek can one day be returned to it’s former glory. 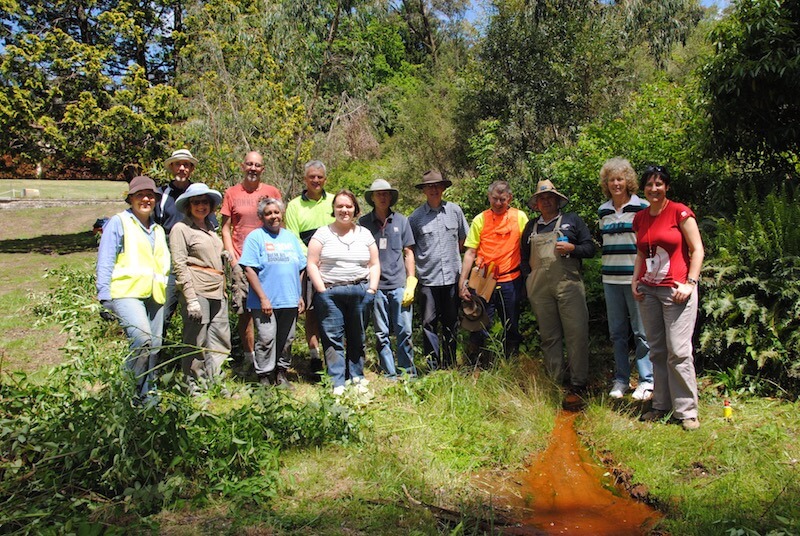 On October 10th, 2015 the volunteers who regularly work in the Jamison Creek Catchment (Jamison St Landcare Group; Charles Darwin Walk Bushcare Group and the Valley of the Waters Bushcare Groups) held their first Catchment Care Day. meet each other and learn about each other’s work. We covered the length of the creek targeting Broom and also a considerable area closer to Wentworth Falls working on Montbretia, Privet, Erica and Japanese honeysuckle. Eric Mahony (BMCC), Michael Hensen (BMCC) and Arthur Henry (NPWS) provided great information about the work in the catchment and the threatened species while we enjoyed a picnic lunch made possible by the NSW Office of Environment & Heritage Saving Our Species Program. A big thank you to everyone involved! This entry was posted in Events, Flora, General, Groups, People, Weeds and tagged catchment, catchment care, catchment group, catchment meeting, Combined catchment day on 17 February, 2016 by Bushcare Office. Thankfully the rain showers overnight cleared and a clear blue sky greeted a group of over 40 very keen volunteers at the Upper Kedumba Bushcare site in Pine St, Katoomba on Sunday November 1st 2015. The ground was ready – we’d already dug about 120 holes and the rain prepared the ground nicely for planting, so it was all systems go! After a quick briefing and acknowledgement of Country at 9am, Jane whipped us into action and within 2 hours the combined efforts of Upper Kedumba, Friends of Katoomba Falls Ck, Garguree Swampcare and Prince Henry Cliff Walk Bushcare Groups had 400 plants in the ground, staked, guarded and watered. Just enough time to pack up the work gear and reconvene at The Gully Heritage Centre where David King and Elly Chatfield greeted us with a sumptuous morning tea/lunch laid on courtesy of the Saving Our Species Program and Sandy Holmes, a Garguree volunteer. Following the glorious food it was on to some inspiring presentations. First, Les Peto spoke about the Fungi and Lichens commonly seen in the Gully and elsewhere in the mountains. Michael Hensen filled us in on the Saving Our Species program to protect the endangered Dwarf Mountain Pine in Katoomba Falls, one of the sources of funding for work in the Gully, and Eric Mahony outlined the current regeneration and restoration works currently underway and planned for the area. David King closed the day with an expression of gratitude to all those who’ve contributed to the success of the Garguree project and other work in the catchment of The Gully and reminded us of the importance of The Gully to the Gundungurra people and especially his late mother, Aunty Mary King. The Gully Get-together is held once every year and is another great example of the benefits of Bushcare groups taking a catchment approach. It can also help break down the sense of isolation that some groups experience, leaving them feeling like their battle with the weeds is unwinnable. By pooling resources and getting together to work and plan we can learn about the issues common to other groups in the nearby area, develop a clearer picture of what’s going on in the catchment and why. And we’re combining our power to do something about it! The Gully Get-together was supported by the NSW Office of Environment and Heritage Save our Species funding and Environmental Trust Protecting our Places grant funding, and the BM Food Co-op. This entry was posted in Events, Groups, Natives, People on 17 February, 2016 by Bushcare Office. On Saturday 7 November, Katoomba Christian Convention launched a Landcare Group for looking after its 26 acre site. Fourteen hearty volunteers worked hard over a full day of guided bush regeneration. ‘It was a tremendous day’s effort and we’re looking forward to continued momentum into the future,’ said Operations Manager Shelley Taylor. Gundungurra Traditional Custodian David King provided a Welcome to Country, sharing stories of the area where his mother, the late Mary King, grew up. 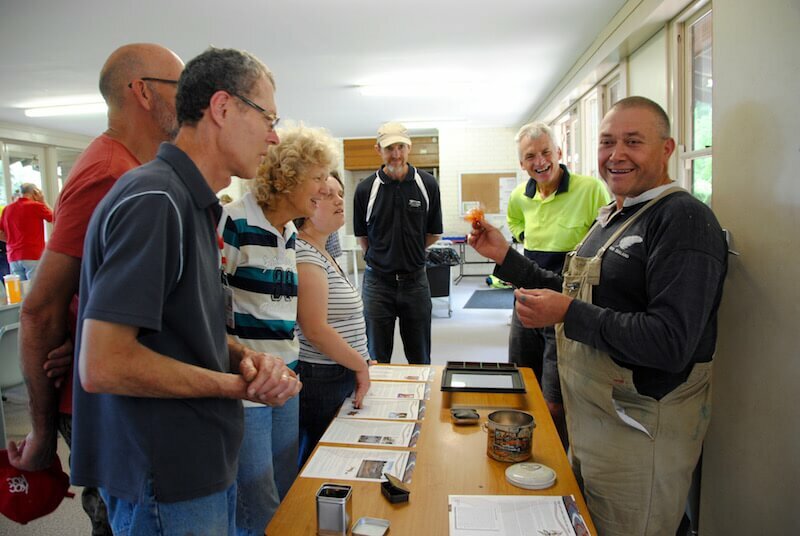 David also gave the volunteer group an introduction to identifying Aboriginal artefacts. The late Mary King had been looking forward to attending the day, that David King and Elly Chatfield attended in her honour. Bushcarer Jenny Schabel, a professional in natural resource management who works with Greater Sydney Local Land Services, volunteered her time to lead the day. Jenny has been a long term supporter of Katoomba Christian Convention and having chats with Operations Manager Shelley Taylor led to the launch of the new group. On the day, during the morning tea and lunch provided, a devotion was shared that involved discussing how Christians need to care for and look after the natural environment as God intended. The day was supported by Blue Mountains City Council with Community Weeds Officer Linda Thomas providing much needed tools on loan for the volunteers to use. Since it started way back in 1903, Katoomba Christian Convention has benefited greatly from volunteer support. Positioned just across the road from Scenic World, right on the doorstep of the Greater Blue Mountains World Heritage Area, Katoomba Christian Convention has beautiful ridgetop bushland. A big chunk of the bush regeneration day involved removing the weeds tutsan, honeysuckle, broom and blackberry along a creek line that feeds a federally significant hanging swamp on the property. Operations Manager Shelley Taylor explained that ‘our vision is to further develop the site to be an eco-tourist destination for attracting groups and conferences to the area’. With four self contained conference centres nestled in bushland, Katoomba Christian Convention accommodates groups ranging from 5 to 540 people, and can seat over 2000 people in its large auditorium. From left to right: Jenny Schabel, Alex Mackenzie, Helen Kryger, John Adamson, Elly Chatfield, Tony Kryger, Kim Greenwood, Ralph Grose, Robert Hegedus, David King, Jenny Adamson, Shelley Taylor. KCC Neighbour Alan Owen missed the photo, but put in a big day of work also. This entry was posted in Groups, News, People on 2 December, 2015 by Bushcare Office.